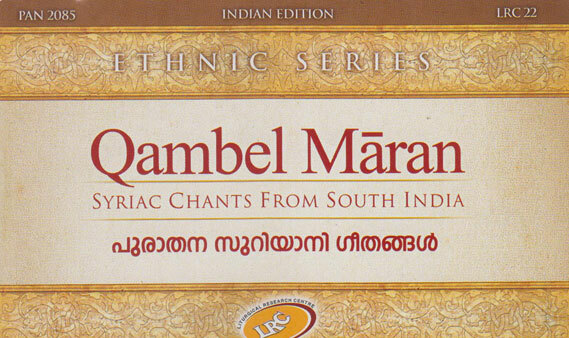 "This CD and its accompanying booklet constitute a signal contribution to the scanty literature on Kerala Christian music"
"This recording makes an important contribution to the documentation of South Asian religious music and of Christian chant traditions." 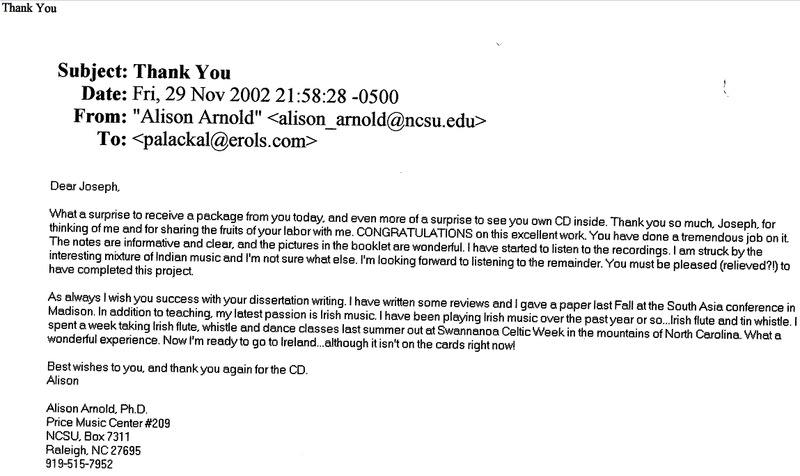 - D. Richard Widdess (SOAS, University of London): Yearbook for Traditional Music, vol. 37 (2005), pp. 184-185. "Palackal has accomplished a magnificent work of preserving a great tradition that is being lost." - Kurian Perumpillikkunnel (Dharmaram Vidyakshethram, Bangalore): Carmela Sandesham, no. 188 (June 2004), pp. 73-78. Johnson Palakkappillil: Journal of Dharma, vol. 30, no. 1 (Jan-Mar 2005), pp. 140-142. 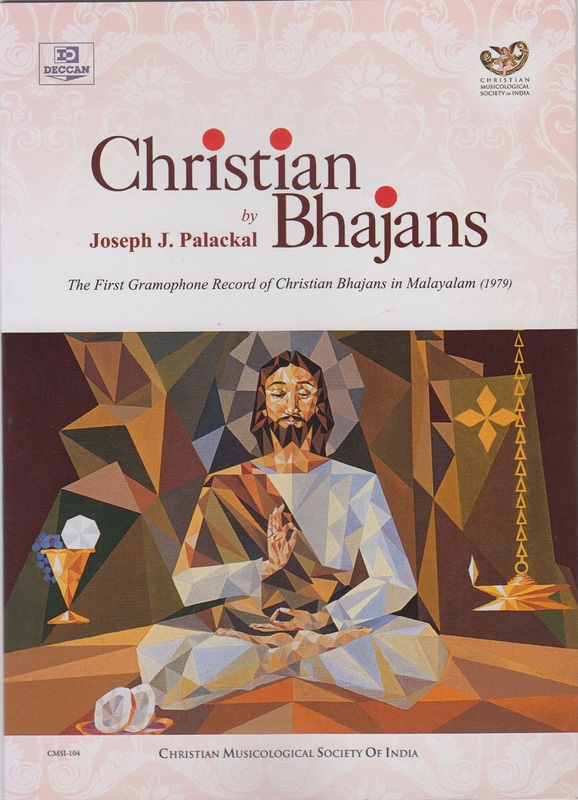 "This important collection reflects the history of multicultural Christianity in Kerala and should be of significant appeal to those interested in early Christian music, Middle Eastern and Orthodox sects (particularly pre-maqam practices), as well as those wanting to diversify their collections of music from India." 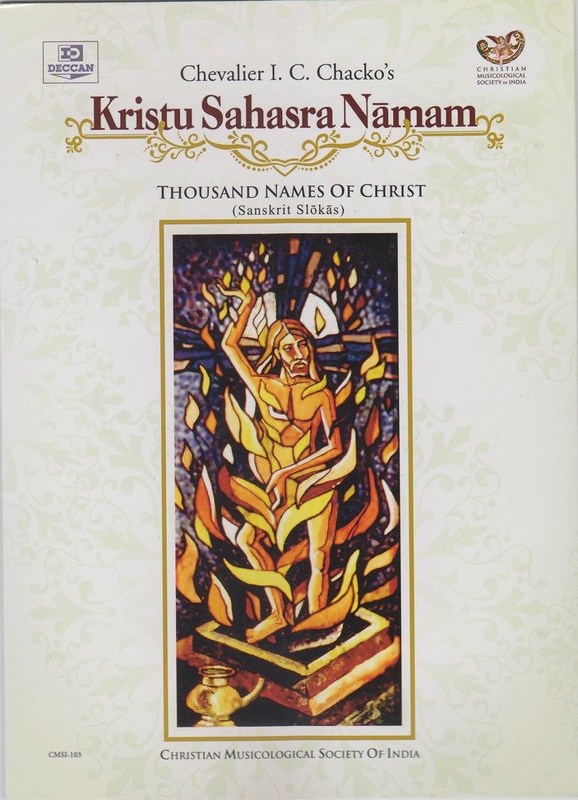 Christian Orient, vol. 27, no. 2 (2006), pp. 82-83. Katherine Morehouse: The Harp, vol. 23 (2008), pp. 414-416. 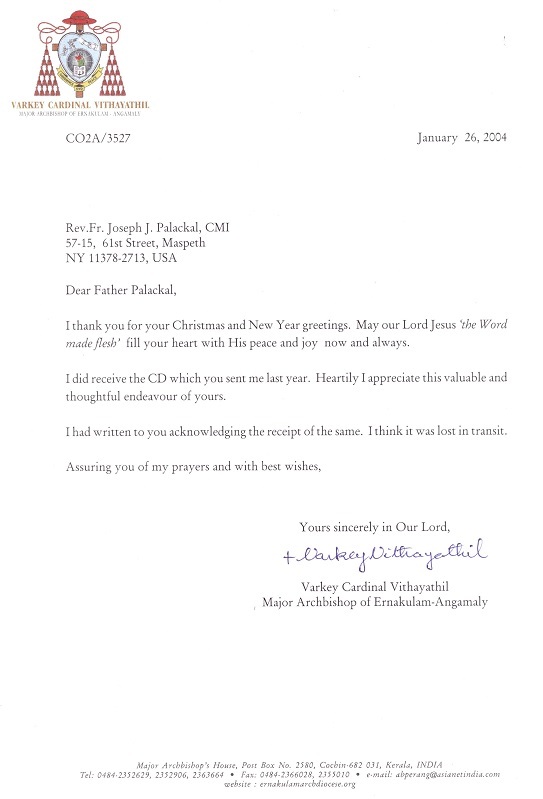 Letter from Bishop Gratian Mundadan C.M.I. 1 4 Awūn d'waśmayyā [Our Father in heaven] 2:26 Liturgy of the Hours Fr. Probus Perumalil C.M.I. (celebrant) & Lonappan Arackal. Fr. 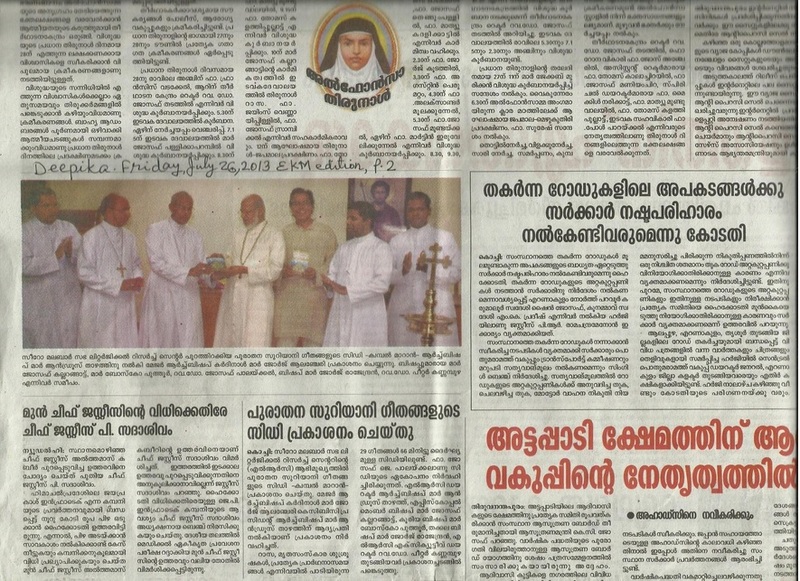 Aiden Kulathinal C.M.I., Fr. Joseph Mutttah C.M.I., Fr. 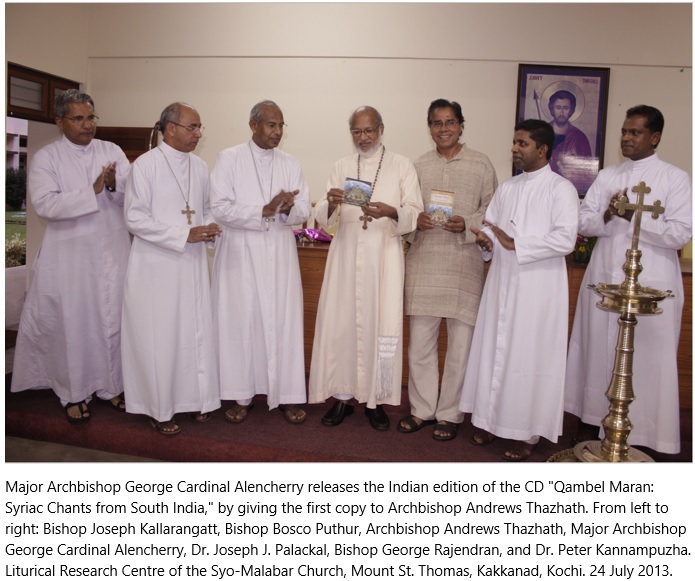 Joseph Mathew Nedumparambil C.M.I., Fr. 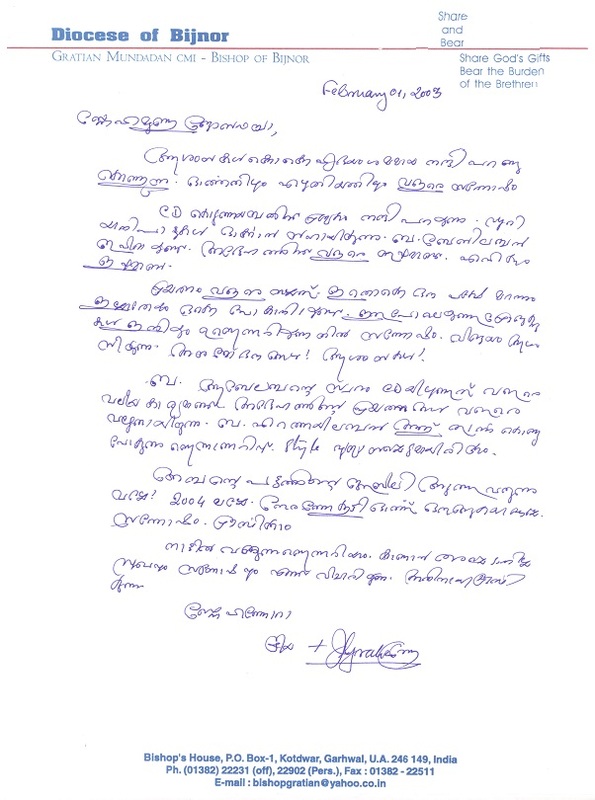 Liberius Ozhukathanam C.M.I. & Fr. Henry Suso Padiyara C.M.I. 2 4a Hallel hallel [Praise, praise] 2:27 Liturgy of the Hours Fr. Probus Perumalil C.M.I. & Fr. Sylvester Puthussery C.M.I. 3 4b Iśo māran m'śihā [Lord Jesus Christ] 2:51 Liturgy of the Hours Incipit: Fr. Alexander Koolipurackal C.M.I. 4 4c Mārya kolhōn hāwbai [Lord, all my faults] 1:41 Liturgy of the Hours Incipit: Fr. Probus Perumalil C.M.I. & Fr. Alexander Koolipurackal C.M.I. 5 4d B'endān saprā [In the morning] 2:04 Liturgy of the Hours Incipit: Fr. Probus Perumalil C.M.I. & Fr. Alexander Koolipurackal C.M.I. 6 4e Esthappānōs [St. Stephen] 1:14 Liturgy of the Hours Incipit: Fr. 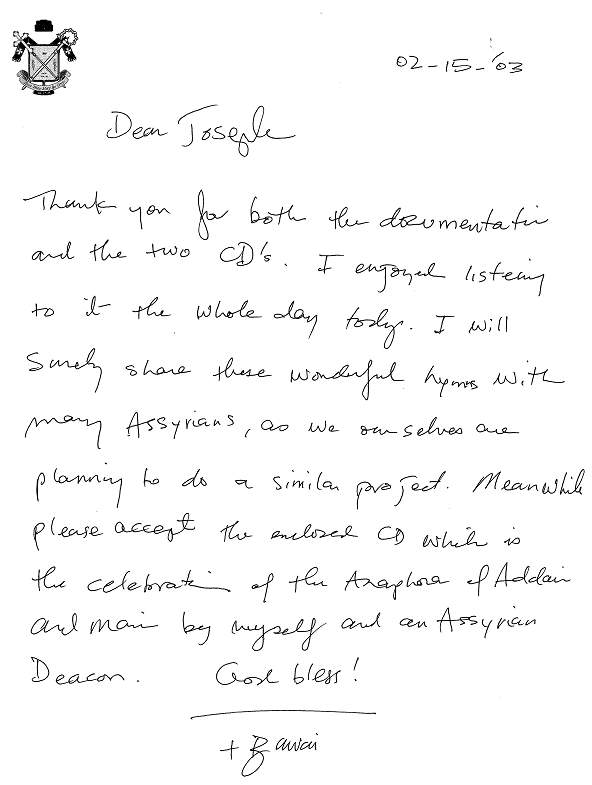 James Aerthayil C.M.I. & Fr. Sylvester Puthussery C.M.I. 7 4f Brīk hannānā¯ [Blessed is the merciful one] 1:10 Liturgy of the Hours Fr. Probus Perumalil C.M.I. & Fr. Alexander Koolipurackal C.M.I. 8 4f Etpan al slōţā [Turn to the prayer] 1:18 Liturgy of the Hours Fr. Probus Perumalil C.M.I. & Fr. Alexander Koolipurackal C.M.I. 9 4g Tāw n'yaqar [Come, let us honor] 1:33 Liturgy of the Hours Fr. Probus Perumalil C.M.I. 10 4h Slīwā dahwā lan [The Cross that became for us] 1:32 Raza Fr. 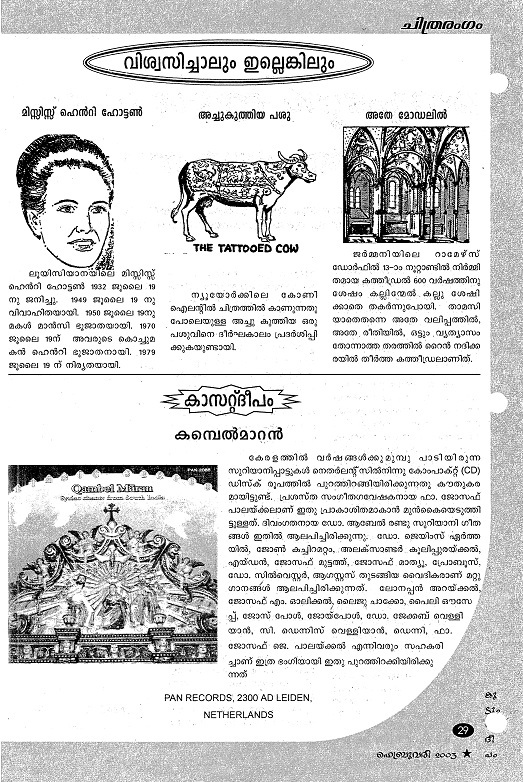 John Kachiramattom C.M.I., Lonappan Arackal & The Syriac choir of St. John's Church, Konthuruthy, Ernakulam. 11 4i O dezdamman īnja [O you who are invited] 1:32 Raza Fr. Abel Periyappuram C.M.I. & Lonappan Arackal. 12 4j K'ţāwā rambā [The great book] 1:28 Raza Fr. Probus Perumalil C.M.I. & Fr. Sylvester Puthussery C.M.I. 13 4k Ślām lēk maryam [Hail Mary] 2:51 Raza Fr. Probus Perumalil C.M.I. 15 4m Lā tekre lāk [Do not be sorry] 2:00 Services for the Dead Fr. Probus Perumalil C.M.I. & Fr. Alexander Koolipurackal C.M.I. 16 4n Laikā ēzal min ruhāk [Where flee from your Spirit?] 2:15 Services for the Dead Incipit: Fr. James Aerthayil C.M.I. & Fr. Alexander Koolipurackal C.M.I. 18 4p Ēttā pū, lēk [Farewell, O church] 2:19 Services for the Dead Fr. Probus Perumalil C.M.I. 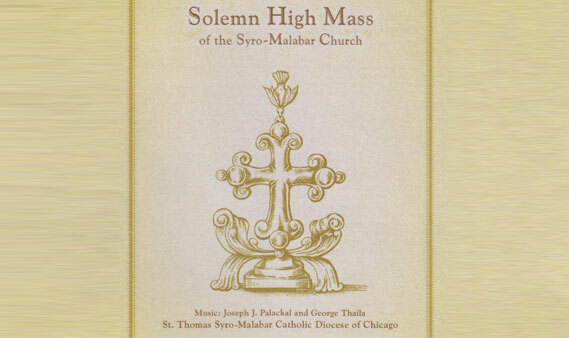 19 4q Quryēlaisōn [Lord, have mercy] 4:40 Syriac Translation of Latin Chants Paily Vathappallil (lead singer), Joseph Pathiamoola & The Syriac choir of St.Mary's Forane Church, Pallippuram, Cherthala. Violin: Ouseph Vathappallil. Harmonium: Paily Vathappallil. Triangle: Joy Paul Vathappallil. Drum: Jose Paul Vathappallil. 20 4r Hā qes slīwā [Behold the wood of the Cross] 2:02 Syriac Translation of Latin Chants Fr. Augustus Thekkanath C.M.I. (celebrant) & Lonappan Arackal (deacon). 23 4u Tā lāk ruhā [Come O Spirit] 2:46 Syriac Translation of Latin Chants Fr. James Aerthayil C.M.I. & Fr. Alexander Koolipurackal C.M.I.